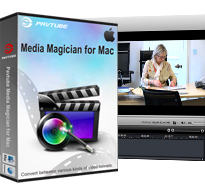 Pavtube Media Magician for Mac – Convert camcorder AVCHD MTS/M2TS/MXF to Apple Prores, AIC, etc. for FCP and uploading to YouTube. Media Magician for Mac helps manage/backup/combine/convert your camcorder footages and videos for better editing in FCP/ FCE/ Avid Studio/ iMovie/ Adobe Premere/ Adobe After Effect/ Apple Aperture, playback on iPad/ iPhone/ Apple TV/ Android Tablets, and sharing on YouTube. The simple editing functionalities help you frame-by-frame trim, join, cut, delete clips on timeline; add 3D and gauss blur effects, etc. You can flip video horizontally, vertically, clockwise, or counter-clockwise as well. Volume can also be enlarged or reduces for output. Moreover, the conversion management list helps create conversion tasks with clicks and output files with different formats from same sources placed on timeline. You can output lossless MTS/MKV from MTS source files which makes it possible to lossless join your camcorder AVCHD MTS clips into one in seconds. In a word, it's a useful HDcam assistant software with smart camcorder wizard helps make better use of your camcorder videos. The simple and easy interface helps connect camcorders to Mac and import directly from camcorder or backup camcorder videos to local. Output Apple Prores MOV, lossless MTS/MKV, MPEG-2/4, AVI/WMV/MOV/MKV/M2TS. As long as you have right version of FCP installed, you can output Apple ProRes MOV like Apple ProRes 422, Apple ProRes 4444, etc. To output videos you can drag relative source from resource list and trim, cut, delete, and join. You can seek the clip frame by frame. Want to get 3D effect to your clips? It's easy with Media Magician. Just a one click, you can add the effect. And you can also add simple Gauss blur, old film, etc. If the volume is too large or too small, you can drag bar in Volume Adjustment section to enlarge or reduce. For footages shot with low light or bad color, you can easily make them better with the help of brightness, contrast, and saturation adjustment. With the preset output profiles, you can choose the right settings with just one click. In conversion settings section, you can create several conversion tasks with different output formats and output from the same sources placed on timeline. The converted videos can be uploaded to YouTube directly as long as you have set your account and relative information. 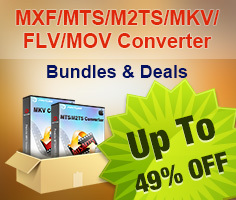 It supports output formats like M2TS, MPEG-4 (*.mp4), MPEG-2 (*.mpg), MKV, MOV, WMV, and AVI. You can reset parameters with ease. Editor: iMovie and Final Cut Express, Avid Studio, Adobe Premiere, Adobe After Effect, Apple Aperture, Final Cut Pro (Apple ProRes MOV). Q: I purchased and tried installing your software on a Mac pro with leopard 10.5 and get a message that says: Install Failed - The Installer could install some files in "/Applications". Contact the software manufacturer for assistance. A: A trail version converts videos with watermark (the logo of Pavtube) on the screen, output up to 5 minutes lossless videos, and asks if you would like to purchase at each run while a retail version allows you to use freely without putting on watermark. As a customer of Pavtube, you will be reminded to update the software whenever a new version is released. The update is free of charge for lifetime. Besides, your emails will be attended at the first time, your advice and requirements will be much valued when we upgrade the software.